Just across the Hudson river from Manhattan, the “Mile Square” city of Hoboken, New Jersey, elected its first Sikh mayor on Tuesday. Democrat Ravi Bhalla, who has served on Hoboken's city council for eight years and was endorsed by outgoing mayor Dawn Zimmer, claimed victory over five rival candidates late Tuesday night. The city of just over 50,000 people was given the opportunity to elect the first openly gay, Latino, or Sikh mayor - one of many local U.S. elections Tuesday considered a precursor of the battle between the Republican and Democratic parties in the Trump era ahead of mid-term elections next year. 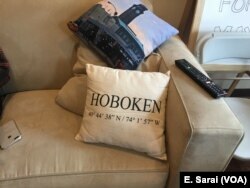 Hoboken is a fairly diverse city, with 15 percent of residents identifying as Hispanic or Latino, and seven percent identifying as Asian - both figures just shy of the statewide average, according to 2010 census data. 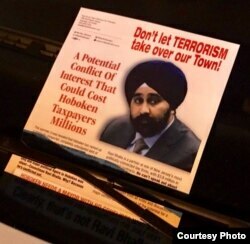 A campaign poster labeled turbaned Sikh Ravi Bhalla as a terrorist. Following the September 11, 2001 terrorist attacks in New York and Washington D.C., the backlash against Muslims across the United States at times also included members of the Sikh faith. Followers of the faith, a monotheistic religion that originated in northern India, are often confused with Muslims. Devout male followers of the Sikh faith keep their beards and hair long and wear turbans. “That said it’s obviously disturbing,” he added. Also disturbed by the fliers was one of Bhalla’s six rivals for the Mayoral seat - Michael DeFusco. The distributed fliers said they were paid for by DeFusco’s campaign - a claim he has denied. A pillow on the couch of Michael DeFusco’s campaign headquarters boasts the city’s coordinates. Police are searching for answers regarding who may have paid for these messages, based on surveillance videos of two individuals placing them on car windshields throughout the city. But in the meantime, DeFusco says the incident harmed his campaign as well as Bhalla’s. DeFusco, currently serving on Hoboken’s city council, is the first openly gay person elected in the city. Erica Commisso, a new Hoboken resident, said she was surprised by the amount of negative campaigning in the local election. “There’s a lot more smear campaigns than I’m used to,” she said. “Everyone’s been inundated with literature drops, and mailers, and robocalls,” Joshua Einstein, a ten-year resident of Hoboken, told VOA. Racist propaganda, however, has been reported even in the most diverse of cities. In Edison, New Jersey, where 28.3 percent of residents identify as Indian-American, locals reported seeing flyers calling to “deport” Indian-American and Chinese-American candidates for the school board. But Bhalla, who along with rival candidates encouraged voters to look past the flier, is now looking forward to the future of his city. "I’ve seen a lot of the great things we’ve done in Hoboken," Bhalla said. "So when the mayor asked me to run for mayor...I felt like it was important to try to continue that forward movement."